We have had to call time on the storage unit where until now we have been keeping all those things we couldn't bear to get rid of when we moved house. It's down to money, as usual. It's simply not practical to continue paying to store things that actually we haven't looked at in the 18 months we've lived here. The flat looks like something out of one of those hoarding programmes I sometimes watch in fascination. There are boxes of books, lots of boxes of books actually, baby clothes, plastic dinosaurs, a dolls house, train sets, camping gear, old financial records. There is all my work from four years of art school, my darkroom kit, studio backdrops, crockery, tools, more books. The contents of our old attic essentially. I don't want to think about how much it has cost us to keep this stuff only now to throw most of it away. Yesterday I casually opened a box of books and there at the top was the prayer book that I had in my possession on the day when my adoptive parents brought me home. I came in a yellow dress, with a small bundle of clothes, feeding instructions and a prayer book. I had thought it lost. 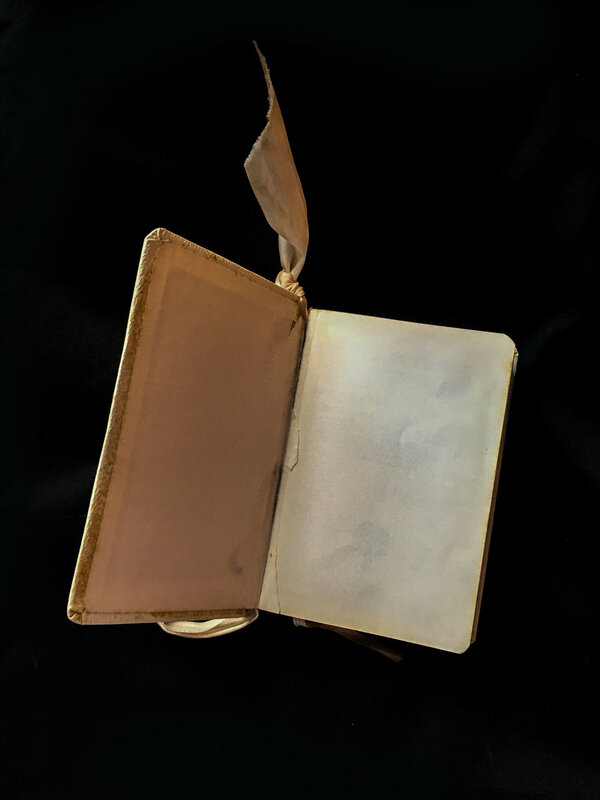 I opened it and recalled the letter that decades after my adoption, my birth father had sent me, in which he told me that he was the one who had provided the prayer book and that it was his writing on the front leaf. There was no writing on the front leaf. Closer inspection revealed that someone had ripped the paper out to ensure I never read it. I had carried this prayer book with me on my wedding day, attached to my bouquet, completely oblivious to this act of vandalism. I had long reconciled myself to the fact that this item was gone and was surprised at the relief I felt on rediscovering it. I felt an urge to photograph it. I recognised the urge. It was the same one which had driven me to photograph our old house on the day that we left it, and to photograph the stuffed animals belonging to my daughters before they went to the charity shop. In some way the photograph came to represent a kind of retention of ownership. Diminished ownership, but enough to allow letting go of the physical object in a way that was less painful than it would have been without the photograph. None of the children have ever asked to see the photographs. I find I can't delete them. So now I find myself thinking about the photograph acting as a kind of surrogate to ownership. I know I've considered the idea of the photograph as memorial before - an aide to memory, a souvenir, but this feels more like 'if I have the photograph it's almost like I have the thing'. I am recalling the words of Walter Benjamin in his book The Work of Art in the Age of Mechanical Reproduction, and where the 'aura' lies. Which prompts me to consider value. The value of the object. The value of the reproduction. The value of the means of reproduction. If I take a photograph of a precious object I'm about to part wtih, using a large format camera, is the resulting image of the thing I won't have any more, more precious than if I'd taken the picture on my phone? If I keep the prayer book, because it has value to me beyond what it would ever be worth to anyone else, why do I still feel an urge to photograph it? Is it because somehow I trust the photograph more than the object? Do I value the photograph more? I recall a visit to Tate Modern a few years back. I had been looking forward to seeing the The EY Exhibition: Paul Klee - Making Visible. I enjoyed it, but a tutor pointed me in the direction of of work by Mira Schendel and this absolutely blew me away. I was mesmerised and quite emotional by the time I was done. Exiting by the gift shop caused quite a conundrum. I wanted the exhibition catalogues for both. I could only justify buying one. I spent a good half hour wandering around the shop mulling it over before plumping for Schendel. The book sits on a shelf in my hall and I can't remember the last time I opened it. I know that I spent some time on the internet trying to find a reduced price Klee catalogue. There were none to be had which is probably just as well because I doubt I'd look at that any more than the one I have. But I felt the need to take a little bit of that exhibition home with me, to make it real. I think that's why people are so compelled to record concerts on their phone instead of sitting/standing/moshing in the moment and watching the performance. They're afraid that if they don't have a reproduction of the real thing, perhaps the real thing didn't happen/wasn't there. I have more to investigate on this theme clearly but for now I simply realise that I need to re-examine my relationship with photography and the motivations for making work. Just what is going on here? “The less you eat, drink and read books; the less you go to the theatre, the dance hall, the public house; the less you think, love, theorise, sing, paint, fence, etc, the more you save - the greater becomes your treasure which neither moths nor dust will devour- your capital. The less you are, the more you have; the less you express your own life, the greater is your alienated life - the greater is the store of your estranged being." Karl Marx. Let's just ignore the fact that I haven't written anything in four months. Things have not been good and our financial situation is pretty horrendous. It is exhausting to keep explaining to friends that you would love to meet them for a drink or go to a film or fundraiser or even over to their house but you can't afford to buy drinks or train fares or raffle tickets or even to drive your car any more. Your world has shrunk to the four walls of your flat and to wherever you can walk. With no capital and no treasure to speak of, you are nonetheless still in danger of being less, of finding yourself estranged from your own essential self. This profound sense of imprisonment and reduction, coupled with a lot of cold, dark and wet weather has led to a sustained bout of self-pity and inertia. Call it my hibernation period if you will. I don't have agoraphobia because I do go out - I go to work and I get myself to the doctor's surgery. I make and mostly attend appointments. But I've been on my Easter holiday for two weeks and I don't need both hands to count the number of times I've left the flat - generally to satisfy an almost overwhelming urge to be near trees and water. I have only recently discovered this place. For reasons that I don’t quite understand, I had thought ‘Duchess Wood’ referred to a rather small strip of trees that in my head extended from Rhu Road Higher near the cricket club up to or around Duchess Park but because I had dismissed it as being not very significant I had never bothered to properly find out. In fact, even if it had only been as I’d imagined, it was probably worth looking at so I don’t know if it fell into that category of things that you don’t bother going to see because you know they’re there…like living in Edinburgh for three years and never feeling the need to visit the castle… or what! That might be something to look into at some point. 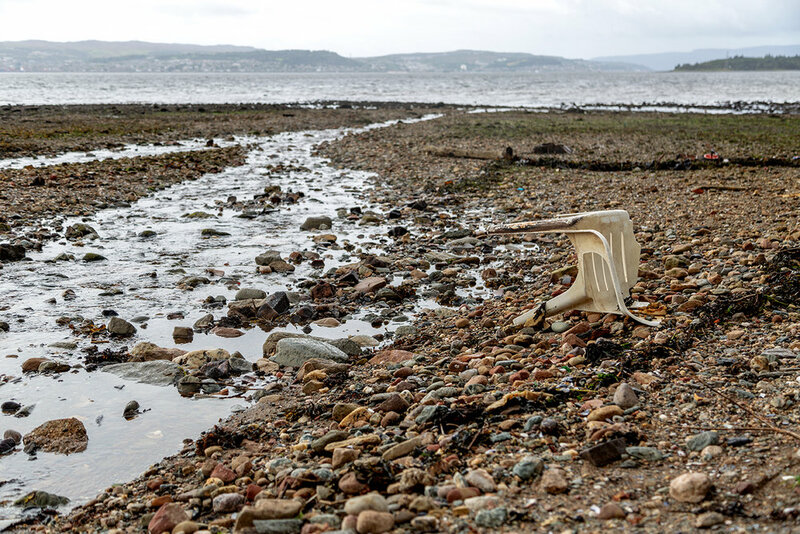 In making Album Familia, I documented something of the material changes to our lives that occurred when we moved to Helensburgh. The effects of the economic impact of unemployment on our housing situation and how that impacted the family. But living in a much smaller house on a vastly reduced income hasn’t been the only impact. We used to live in a village and now we’re very much in town. I used to be able to walk for two minutes and find myself on a beach where it was very unlikely I’d meet anyone at all for the duration of my walk, but even if I did, it would be someone I knew or recognised. I could be on my own, near water or under trees and drinking in sea air and wind, listening to rustling leaves and letting my thoughts drift and relaxing in no time at all. It wasn’t all idyllic - the litter problem on the beach was horrendous but it was possible to walk and be alone and feel part of nature nonetheless. In town that is much more difficult. I was pleased, actually relieved is probably the right word, that we managed to find a flat on the seafront with incredible sea views. It is restorative even to be able to look out onto the water, but it’s a very different experience to walk along the seafront in town. There is an almost constant thrum of traffic and it’s quite rare to bump into people you know - there are a lot of visitors and strangers. And there are no trees. For all that I love the water, I began to realise that I was almost yearning to be in under trees. Our old house had a garden and there were Rowan Trees, silver birch, firs, hedges, shrubs and a burn running along the far side - with more trees behind it. Here we share a garden and while there is a old beech tree (?) in one corner it is largely dominated by the wall of the old cinema on one side, and the wall of a nearby restaurant on the other. It’s also ‘communal’ which means it’s hard to feel any real sense of belonging when we are very much the newcomers. If more long-standing residents are out there I don’t feel comfortable staking a claim to the space much as it is my right to do so. It’s not their fault - it’s down to me. So where to go if you have no money and you feel the need to ‘forest bathe’? The park seems like an obvious choice. As I walked around the streets (many of which in this town do have trees, which makes it very pleasant to drive through even if there’s nowhere but your car to sit and enjoy them) I was getting more and more desperate to find a leafy spot to sit and just breathe. On that first venture, I went to the park, (Hermitage Park) only to find it closed. Renovations were afoot and as preparatory work began the whole area seemed to be closed off. I was almost in tears as the frustration of not being able to find a space began to feel overwhelming. I went back to the park several times over the next few months as parts became accessible again and I have been documenting the changes to access on an ad hoc basis ever since. I talked to my youngest about my visits to the park and she announced that it was 'spoiled' now. She wanted something less tamed, less pruned and with fewer neat pathways. I understand what she was saying because a park generally is a cultivated space and as she had grown up knowing it in its state of neglect, these new moves must have felt instrusive to her sense of what felt right. But I determined to show her that there was still much to enjoy there and started looking at some of the details to be found in the park, attempting to document how being there made me feel rather than just recording the state of it. Nonetheless her problem resonated with me, afterall, a park is managed and my heart and soul were tired of things that people had made. Buildings. Streets. Plans. I was desperate for something less planned, less constructed. Something wilder. A chance conversation a few weeks ago made me think of Duchess Wood. I hadn’t given it a second thought in years and decided it was time to go and have a look. I did note as well that my walk there took me past some of the more impressive properties in Helensburgh each with their own secluded patch of green space. It is more or less where Montrose Street merges into Rhu Road Higher that, if you know to look for it, you can find one of the entrances to Duchess Wood. This is where I had previously thought it began and pretty much ended. There is a fence marking the property boundary of flats further up the hill on one side, and the edge of the cricket ground on the other. You step off the pavement (not that it’s really a proper pavement at this point - perhaps another thing to document) and you are in among trees. Of course you can still hear traffic, and people calling to each other if there is activity going on at the cricket or rugby clubs but immediately you start to feel the calming influence of being near wood, leaves, moss, lichen, soil and ‘critters’. I was aware of an almost exhilarating sense of freedom being in the woods even though it was busier in there on a sunny day than I might have wished for. It is considerably more wood than I had at first realised, but it is still a fairly contained area and evidently I was the last person on earth to realise it was there so it’s not surprising that I had company. In spite of that I came out feeling refreshed, positive and considering I’d been walking around for about two hours by then, quite up for taking a longer route home by the seashore than I’d initially planned. There’s definitely something to this idea of ‘forest bathing’! I resolved to come back another time and explore a bit more. It was to be five weeks before I made it back to the wood. For my second visit it was a last minute tag onto a walk along the seashore and I was in a great deal of pain by the time I arrived. I was partly blaming an overloaded rucksack but my hips/ankles/back/neck/knees - pretty much everything actually - were complaining loudly. Consequently I didn’t do a repeat of my previous walk but entered at Kathleen Park, took a very quick dip into the woods on that side, moving away from the more established paths, before coming back to the rear rugby pitch and walking behind it over to where it meets up with Millig Street. I had noticed on my way there, coming at it from a different angle, that there is a new housing estate being built by Persimmon. Quite how it is going to affect the wood isn’t obvious from down on Rhu Road Higher but it becomes very evident when you reach the boundary line further up the hill. At the same time I’m also pondering just who is ‘managing’ the wood at the moment. The Friends of Duchess Wood website hasnt’ been updated in three years. Is it just being left to rot? I brought one of my Argyll College students to the wood to practice some photography as well to get some exercise. We were out for a couple of hours and looped from the Kathleen Park entrance and back again. I had walked from our flat up and along through residential areas and my student (Ron) picked me up because I was running late. He also gave me a lift back afterwards as I was struggling with walking. 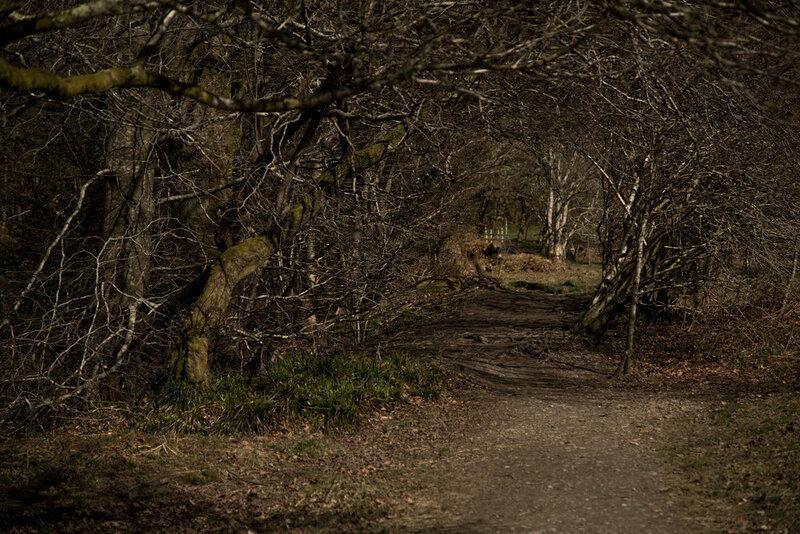 I became aware as I was taking some of these that the reason I was so attracted to making the shot was because something was reminding me of other experiences - holidays I’d taken as a child with my family in Scotland for instance. We didn’t have a lot of money growing up, but there was usually a self-catering holiday of some sort, taken out of season in a croft, cottage, boat or log cabin. Entertainment was most often in the form of long walks, card games, badminton (not on a court, just on whatever vaguely level scrap of ground we could find…vaguely level describing any kind of incline you can think of actually), fishing, and so on. We explored country houses, stately homes, nature reserves, moors, hills, forests. Sometimes these places were ‘managed’ and featured actual tourist destinations so that there mgith be a cafe or a gift shop but more often than not they counted as wilderness. Just, scenery to be explored. Now that we have no money, and by that I mean not enough to feed ourselves if we continue to pay all our bills, I feel my world shrinking and what little green space there is for me to explore feels all the more precious. It’s not just our own finances though, Brexit feels like a shrinking too. All those people who want to close our borders and cut ourselves off from Europe don’t seem to feel it. Is it because they have green space to call their own and are content in their own oases so that they don’t see how some of us yearn to expand and explore and get out there? I don’t know. But when whatever entertainment I might have now has to be free I’m aware that I don’t take kindly to developers potentially ruining it. Which leaves me with some other questions. Who is looking after Duchess Wood now? Who protects it from further development? We met a dog walker on Wednesday who stopped to chat. He had a lot to say about Persimmon’s activities and about the management of the wood too. “This is what happens when you leave it to the local authorities” he said. which is a five year Managment Plan for for Duchess Wood. In it, it states that the wood has Local Nature Reserve (LNR) status, one of only two in the entirety of Argyll & Bute. 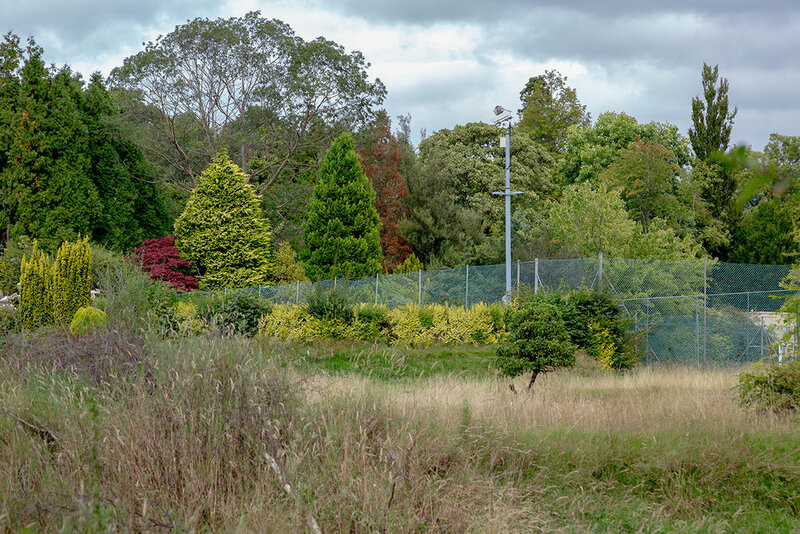 It is also an Open Space Protection Area, lies within Helensburgh’s Green Belt and appears on the Scottish Natual Heritage Ancient Woodland Inventory as a “Woodland of Long Established Plantation Origin”. Under the heading ‘Value’ it is noted that Duchess Wood is “A model nature reserve and community woodland. It is important to emphasise that the value of the Wood is seen not only in terms of its biodiversity, but in its recreational and social uses, and its role in enhancing both the physical and mental health of the community." 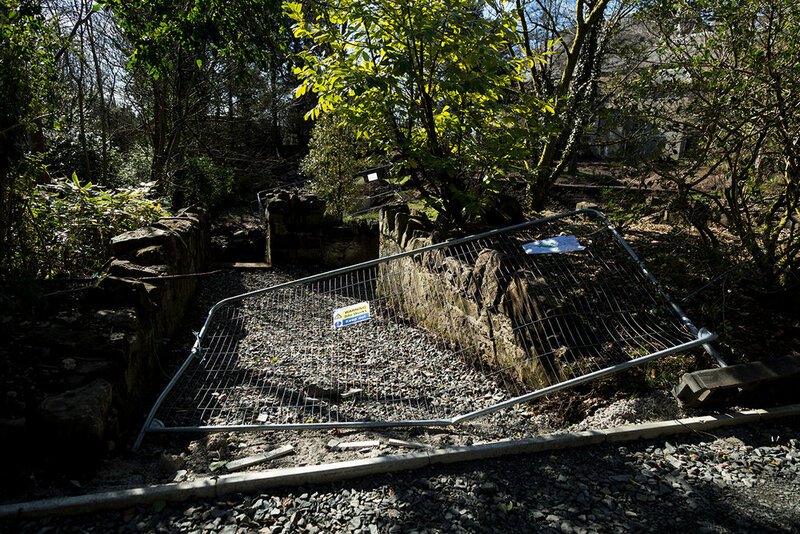 Under ‘Management and Partnership’ it says "The landowner is Luss Estates Company (LEC) which in 2010 renewed its Management Agreement (MA) with Argyll and Bute Council (A&BC) to manage the Wood as a Local Nature Reserve for a further ten years, until 31 July 5 2020." 55. Access in and around the Wood has the potential to bring health benefits – both physical and mental – to all visitors, and one of the main objectives over the period of the Plan will be to explain these benefits to local users (and potential users) and visitors, as part of the wider campaign to improve Scotland’s health. A recreational overview is given in paragraph 71 below. The Wood is used regularly for cross-country races and training, and for orienteering, and it is has been agreed that a semi-permanent but discreet orienteering course will be established in the Wood. Other challenging athletic events have been held in the Wood in recent years. There are also believed to be geocache points in the Wood which attract visitors. However even regular walking in the Wood brings health benefits – the main path has a fair incline and a circuit from any of the main entry points is about 1 mile in length. In addition although the Wood is busy at times, and social interaction is frequent, it is also easy to go round the Wood and not see anyone; this green circuit, with regular birdsong, varied flowers and trees, and the occasional deer is ideal for helping quiet contemplation and helping to resolving mental challenges. In explaining and publicising the attractions of the Wood, the health benefits will be given greater priority during the period of this Plan. So it seems I’m not alone in thinking that a walk round the woods is mentally beneficial in addition to whatever physical benefits it may also offer. Clearly I have more research to do but my current thinking is around the mental health benefits of green space, access to it and what people do if they can't get there. I mean already I'm conscious that walking to Duchess Wood so that I can walk around it and then walking back home has an impact on my pain levels, both at the time and in the days afterwards. Walking to the park is less arduous but is it as beneficial? And what of those who can't do either? One of the things that I really feel art school helped me with was the discipline of reflection. It was an integral part of our learning, something that becomes as much a part of the creative process as the actual making of work. Like many of my peers I struggled with it somewhat at first and even when I began to embrace it as another tool to use, I wasn't sure if it was best to get writing things down straight away, or to let things percolate for a while. The main snag with the latter approach of course is that it's all too easy to confuse percolation with procrastination which is what I fear I'm in the grip of right now. It isn't quite a month since I last sat down and tried to write but it feels like forever. It has been one of those months whereby lots has happened but also nothing much has happened. I seem to lurch from intensity to ennui at the drop of a hat and mostly it is just leaving me exhausted. Part of the issue of course is a lack of an outside stimulus to make work, (tutors, academia) and an adjustment to a change in routine. While at art school I had a timetable and expectations to meet and so I stuck to it, and I met them. No matter the difficulty or stress, there was a certain sense of there being a status quo: I am student. My identity was settled, I knew what my goals were and ultimately they seemed achievable. I had rather assumed that after graduation, I would be working at something full time. Instead I accepted a part time job share on the grounds that perhaps it would leave me time to find another part time job to make up the difference, and also that it would leave time to make new work. After all, I have spent a lot of time and energy on Album Familia, and while it is doing good things for me, I don't want it to be my only legacy - there are other stories to tell. But I find myself in this awful state of limbo. I'm working, but the hours are insufficient to support us for very long. So I have to find more work. Which means I can't be 'settled'. There is no status quo. There is no sense of understanding my position. I'm really struggling with the words today. Imagine something for me. There's a high-backed winged chair, in a room with tall windows. You can see dust motes gently being wafted around a wintery intrusion of light. The upholstery on the chair is a little faded, the seat cushion slightly dimpled as if when the occupant stood up they left something of their heft behind. A gas fire spits occasionally and the chair is postioned such that your feet will take up a space somewhere between where they would singe and where they would suffer chill air. A book rests, open and face down on the armrest. A coffee sits on coaster on a round topped table adjacent, too hot to drink right now but destined to be the perfect temperature by the time you've read the next chapter of the book. The tree outside the tall window taps the glass occasionally and there is a bird jumping from branch to the ground where you can't see what he's doing but it doesn't matter because that's outside of this room. Shelves of well-read books absorb anything that threatens to disturb. Voices, from elsewhere form a backdrop of burble which only enhances the still, in this room, where you are about to sit down and read. For an hour. Maybe more. No-one will come except perhaps a cat who, like you, will ignore the bird, then sniff your toes momentarily before lying down flat in the singe zone. I have never been in this room, but I imagine it often. It is, I suppose, a depiction of an ideal state. Undisturbed, and undisturbable if only because it is a fiction. Imagine something else. An office chair that can be projected across a room, swivelling round at will. It was blue once but now the edges are a greasy grey and the fabric, which in some places still reveals the warp and weft has mostly matted, spawning felted baubles like fungi. The phone is ringing and you know you have to answer it but you can't remember where you are or what these people think you are called. A computer sits in front of you, seventeen tabs open, but not the one you need. You go to sit down but someone has moved your chair and in its place is a green plastic moulded seat with a splodge of white paint solidified mid-drip on the back. It jams on the carpet tiles as you try to move nearer to the desk. A visitor can't get in the front door, the handle is jamming. You could reach but you're on the phone and the language your caller speaks is only nearly your own. There was an intense period of recovery and recuperation after graduating which I realise sounds mad but was necessary, and then there was an initial degree of elation at finding a job. do i have to lose or give up something to fit in and be accepted. adoption. loss. who or what else? self. marriage. children.self. loss of what? loss of art school. September has been and gone. At the beginning of the month, Facebook threw up a memory of a meme poking fun at all the people declaring that they couldn't believe it was September 'already'. And there it is... gone. Looking back, it's no surprise as it really was a busy month for me. Early on we celebrated my middle child's 18th birthday, and towards the end, her big brother's 20th. (I know. September birthdays. I've always loved Christmas ;-)) It's an exciting time for them both as one embarks on his third year at university and the other is starting out on a musical theatre course. With them both firmly ensconced in their student accommodations, there are only three of us living in the flat now so it feels a whole lot less like something that might have featured in Fred Engels' 'Condition of the Working Class...' Not that anyone was working. (Other than the now 18 year old who was very organised in finding herself a waitressing job as soon as she landed in Glasgow.) The rest of us leapt from middle class to underclass in just a few less-than-easy steps. I've said it before, but it's harder than you'd think to graduate. I don't mean the effort involved in achieving graduation but the shock of no longer being a student is actually quite profound. For four years that was my 'identity'. I used to joke about it. "I'm an art student!" I'd say, as if it were ridiculous at my age to be such a thing. But the truth is I was rather proud of that. It was something I'd have liked to have been able to announce at 17 or 18, and the fact that I belatedly achieved it was a source of pleasure for me even as I found it quite difficult at times. Then you graduate. Suddenly you're not a student any more. People call themselves 'recent graduates', clinging onto their studenthood for just a little bit longer. At what point is your graduation no longer recent though? It was a question that arose during a one day seminar held at Stills in Edinburgh. Half a dozen or so photographers who had once been recent graduates gave us the benefit of their experiences and their pathways to working in their chosen field. In a lot of ways it made for depressing hearing. Few, if any of them had been able to support themselves soley from photography, certainly not in the first 5-7 years post graduation. All of them, even a photographer whose work I admired and inspected in great depth during my studies, had 'other' jobs to pay the bills. Sarah Amy Fishlock...waitress. It was not what I wanted to hear. Although at the same time, it was. I needed to hear that my failure to secure a decent income from photography was not just down to my failings, but an effect of the way that photography is seen and used and procured in this digital age when everyone's frankly, a photographer. At least I would not be struggling alone. At least I could take that pressure off myself. So I walked away from Stills feeling in almost equal parts depressed and determined. There was little chance of making a living from doing the kind of photography that actually inspires me. But there could be a chance of finding work that would allow me to make the kind of photography that inspires me. As the sole potential earner in the family however, I couldn't rely on just a waitressing job. Even my 18 year old is only using that to supplement a student loan and bursary. I have a mortgage to pay and Adobe Photoshop is not free. In fact it's even less free than it was when I was a student! So September saw a continuation of the process of applying for things that I had started in late July and August. I applied for competitions, for mentoring programmes, for jobs, for internships, for residencies, for funding. There was a lot of rejection, and that was hard. It's hardest of all not to take it personally. When you're a student, you're used to putting your work up for critique, but you know your audience and they know your work. Once you leave that art school bubble, your work is being compared to that of thousands of other hopefuls and those looking at it don't get much time to make decisions. I decided that honestly the best way to think about it was as a lottery. You put it out there often enough and maybe you'll win something. My first 'win' was to be asked along to Street Level Photoworks in Glasgow for an audience with John Duncan, editor of Source Photographic Review. I took along over three hundred images made during the process of creating Album Familia. It was fascinating to see the work from a new perspective, and not only because the seating arrangements meant that I was looking at it upside down. Here was someone who had not been there from the start, listening to my woes, watching me go up and down the emotional scales as I photographed my family, came to terms with loss and carried on studying through it all. These eyes only saw the images. Fresh. Without prejudice. His eventual edit, to be taken into an editorial meeting at a later date was quite different from any I'd put together for my own purposes. He chose images that didn't make it into the book and put combinations together that I might never otherwise have thought about. He had a magazine spread to fill which accounted for some of his decision-making process but there was also less focus on the family and more on the unsettled political climate and economic uncertainty that umbrella'd this project from the outset. It was gratifying to see work that I'd worried had been too personal, take on this extra element that others could relate to. John asked me where I saw the work, what I thought I might do with it, and I had to admit, beyond entering it into The Jill Todd Photographic Award, I hadn't really known what to do with it. Which is when he admitted that he was on the judging panel convening the next day! I didn't have to wait too long to find out about my next 'win' - the work that I made for Album Familia had been selected as one of the three prizewinning submissions. To say I'm pleased has to be the very least effective way of conveying how I feel about this. I know that work done by at least three other photographers that I admire very much has made it to this stage and to be included among them is a privilege. There was a third September win. I interviewed for, was offered and accepted a job working as a Centre Administrator for the new Helensburgh Learning Centre of Argyll College. We're part of the University of the Highlands and Islands providing Further and Higher Education opportunities to students in some of the more remote areas of Argyll. Helensburgh doesn't feel that remote to me, being only 40-odd minutes on the train from Glasgow but there isn't that much locally for those who might not want to, or can't afford to travel or move away to learn. On some levels, being a part of this is quite exciting - the Helensburgh Learning Centre has only just opened, about a week before I started to work there, so I'm in on the ground, watching and helping it develop into something that hopefully will give others a chance to gain qualifications in areas that will help them progress on to bigger and better things. There are downsides. The job has no photography element whatsoever. It is only a part time job share and the pay is insufficient on its own to keep us out of trouble. There are days when I feel crushed with disappointment not to be doing something more creative, more stimulating, and more exciting. Administration on its own is not something that stirs up the passions, but I'm new, in a new job and it will take time to settle in. Besides, I see opportunities for growth here and if Sarah Amy Fishlock can be a Waitress and Photographer then I can be a Centre Administrator and Photographer. Consequently I have been taking the camera to work. Afterall, I'm a documentary photographer and I have a foot in the door at the beginning of an exciting adventure - for me, and for Argyll College. There may well come a time when the college will want to have documented its roots in Helensburgh and who is better placed to do that than me? When I write of a 'new' learning centre, I'm aware that this is a little misleading. It conjures up images of a brand-spanking new-build replete with fresh plasterboard and a vague smell of Ikea when the reality is somewhat far from that. My new place of work used to be the Community Centre in Kirkmichael, an area that before the Right To Buy policy kicked in was exclusively social housing and which still represents the less well-off end of town. The Centre was home to various groups and we've found evidence in cupboards and drawers of Rainbows, Bible Classes, and other youth-oriented activities, as well as signs that the older population made use of the space. There is definitely a liminal, transitional sense to the building as the first students take up their places on courses and we begin to depopulate the space of its old inhabitant's relics and make it something entirely different. Something in my psyche relishes this unsettled period of adjustment, discovering traces of what went before and adding new layers to the ongoing history of the place. There are rooms where students learn by Video Conference, surrounded by Charles Rennie Mockintosh murals and playgroup proportioned tables, there are rooms which have not yet found their purpose, cupboards we haven't found keys for and office spaces with no-one in office. Of course, you can't help but wonder where all these groups have gone instead. If there was a need for them once, did that need simply evaporate? I doubt it somehow. Even though I've not been there long, I've already had my first work-related trip away from the office. I was sent to attend a First Aid training course which involved a lovely drive to and an enjoyable day spent in Dunoon, refreshing my memory on CPR, bandaging techniques and signs and symptoms to look out for. We had a very engaging trainer and although not perhaps the most important element of the day, a fine selection of cakes, soup and sandwiches to sustain us as we learned. The light on the drive to Dunoon was perfect for some landscape photography, but unfortunately I had a deadline to meet and no time to stop and take photographs. As is often the case, the light on the way home, when I had no deadline, was dull, dreary and pretty much useless. I stopped to take a few shots anyway. The route was full of sights familiar to me from childhood as my parents had a house in Innellen. It was an absolute nostalgia-fest for me as I drove, each corner bringing back a smack of recognition, and nowhere more so than at Coylet. I vividly remember going here for Chicken In A Basket. At that point in the 70s it would have been culinary sophistication incarnate and had the added bonus of being eaten outside at tables overlooking Loch Eck. Unfortunately, when I rocked up, the Coylet Inn was all boarded up and empty. This saddened me more than I would have thought possible, perhaps because it's a spot that makes me think of my dad and a small part of me had hoped to be able to nurse a glass of something in his name while sitting at tables in a spot where I have such good memories of him. I felt robbed and saddened and almost wished I had not come. Even though the light was hardly any use for photographic purposes, I still felt compelled to take a picture. I was glad in a way that Dad wasn't around any more to see this because I think he'd have been sad about it too and I'd rather think of him as his more usual happy, enthusiastic self. For that reason, I turned my back on the Inn and took a shot of the water instead. I can hear his voice urging us as we drove through the west coast of Scotland on our family holidays to 'Just look! Just look at that!' Like most kids probably, I couldn't see the attraction then, viewing the road as nothing more than a means to getting to somewhere. Nowadays, the journey there is almost the best bit, especially when surrounded by hills and water like this. Back home and I still found plenty of opportunities to get the camera out. I managed to pin Peter down to a morning in the shop where he surprised me with several good suggestions for shots. I got the impression he had some kind of understanding of the process I was going through, so it ended up not being all that much of a surprise to find out that this wasn't the first time he'd featured in a photographer's body of work. When researching his shop online, I found he'd been photographed by Nick Dawe for his project, Nation of Shopkeepers. I am always keen to see what others have done - for inspiration and to make sure that I'm not covering old ground. Although Peter appears in Dawe's body of work, he's not sole subject and the whole project seems to focus on an idea of a collective typology of eccentric shopkeepers which is somewhat different to what I am hoping to achieve. That said, I liked the idea of including some of the other business owners on the street where I live and so when an announcement was made that the toy shop was about to close, I asked the owner if I could go along and make some pictures of it to include. She agreed and I nipped along to photograph her and the interior of the shop so that there would be a record of it before it eventually changed hands. I'm delighted to say that the shop won't be closing now afterall as a member of her existing staff has decided to take it on - I am hoping to speak to the new owner about a new set of photographs once that has happened. On the subject of things closing, it was announced that the 'shows' which have been situated on Helensburgh's pier for as long as I can remember, will not be granted a license to stay now that the carpark renovations have been given the go-ahead. This seemed to prompt mixed feelings among Helensburgh residents, with some being delighted that the 'eyesore' would finally be banished, and others coming over all nostalgic for the last time they had a whizz on the Waltzers. I find myself in two minds. In an ideal world the owners would have been granted license to stay for a period of time that made investment and repair worth their while and then perhaps we could have had an attraction to be proud of. In any case I always enjoyed photographing them and I'm not sure the new improvements will be nearly so photographically interesting. We'll see. Unsurprisingly, Peter had an opinion and spent some time sharing it with me. But while I was talking to him, he also mentioned that there were mayflies to be found up at the skating pond. It occurred to me that it probably hasn't been used for skating in a long time, what with global warming and all. I think it must be more than 20 years since it froze over last. I stopped on my way home from Glasgow last week to check it out. Wrong time of day and weather probably for mayflies - far too blowy for a start. But the autumn colours are starting to make an appearance and as I needed a cover shot for my work-related facebook page, I took some shots. Comparing this rather pastoral scene to the shots of the Kirkmichael Community Centre makes me realise just what a town of contrasts Helensburgh really is. I had some good news yesterday. I had entered two images into the open call for Photography On A Postcard. I'd forgotten about it until a couple of weeks ago when I had an email to say that my image had not been successful. It's always a blow even when you aren't pinning all your hopes and dreams on it. Why not, you screech? What was WRONG with it? And then you come to your senses, realise it's a lottery and also that in fact, they only appear to have rejected one of the two. No word about what was happening with the second. Until yesterday when I had an email informing me that my second image had been selected for the sale and exhibition. This is a fundraising activity for the Hepatitis C Trust. There are 1500 images from a variety of photographers - some invited 'celebrity' names and some who answered the open call - a mix I think of 2:1. Tickets will go on sale from October 12, and while every ticket paid for guarantees a postcard, there's no indication of which ticket will apply to which card. So you could get mine. Or you could get a postcard by Martin Parr. Or Liz Hingley. Or Nick Turpin. Or Wolfgang Tillmans. Or me! All the images will be exhibited in Shoreditch ahead of the sale - my second London exhibition this year! As delighted as I am, (and I am, very), I'm quite keen to be making new work and not merely re-visiting old stock, so to speak. I hadn't seen Peter for a while. He went away to a wedding and his schedule and mine don't seem to coincide much. By which I mean that whenever I happen past the shop he seems to have closed it. Someone told me a while back that he had announced his retirement but I guess he hasn't quite made that leap yet. In the mean time it feels like he picks and chooses when he's open or not. Seems fair enough to me. Anyway I nipped in yesterday morning and asked when would be a good time to come back. He didn't seem to be all that busy (although granted he could have been doing a stocktake for all I know) and I was thinking maybe 'now' would work but he asked me to come back on Thursday when Kay was there. I haven't been introduced to Kay but I'm guessing she is the lady I photographed in the window last time. I will have to ask her if she's up for being part of this too. And get her story. How do you end up working on a Thursday for Peter? How long has she been doing it? What else does she do? Peter has figured out who I am on Facebook. It took him a little while but he was keen to revisit the last posts related to terrible parking in town and the idiots who persistently block our driveway. He handed me some leaflets that he had made up, stating that 'laziness is not a disability' next to the familiar wheelchair logo. I don't know that there is any designated disabled parking near us here so they may be moot but I carefully folded them into my backpack. We also talked about the Waverley which had a bit of a bump at Rothesay last week and is currently out of commission. I wonder if she'll mend in time for the rest of this season? If not then I'll have to wait until October to see her again. I said hello to the dogs. I don't think they belong to Peter, but are in fact his neighbour's pets. He seems to have them in his care quite a lot though. I regularly see him walking with them, and now I noticed that they have beds in the back of the shop too. They're rather lovely - the black one especially is as friendly as it gets and even though they were far too well behaved to get up from their mats, they both gave me lots of wags. I should like a dog one day I think. The main purpose of my walk yesterday was actually to buy a magazine. I have pretty much given up reading magazines since Michael lost his job - just too expensive. But a photographer I know was featured in Roger Hicks' 'Final Analysis' column in Amateur Photographer and I wanted to do a bit of quick research into another magazine which is running a competition that I'm considering entering work into. I figured I'd walk along the seafront, see what was happening, and then get my magazine before deciding what else to do. I noticed that the sports shop was suddenly emptying. Only two weeks ago I was buying dance shoes for my daughter in Morrisons Sport. Yesterday they were hauling out the last of the stock. Tomorrow it will be gone. The shopkeeper saw me standing there with a camera and came out to chat. I explained my project and we discussed memories of the place going all the way back to when it had been Carousel. It was owned by the Arcari family then. One of the sisters was in my class at school and I still see another of them around every now and then. In fact I was talking to her at the Summer Festival just a couple of weeks back. Connections - you see, they are there, one way or another. In the end I didn't buy AP but scan-read the article standing in the now very cramped aisles at WH Smith. I'm guessing they thought fewer people would stand and read the stock if they made it incredibly uncomfortable? That clearly didn't work. I did buy Aesthetica - it's one of my favourite reads actually but at nearly £5 it's a huge treat. After that I wasn't quite ready to burrow back in my cave so I carried on walking. I'm pleased to report that 'the knee' gave no trouble although I was a bit apprehensive about potentially having to make a dash for it around the cordoned-off bit of pavement on east Clyde Street. The building has been declared unfit, and I assume that while work is going on to prop it up, the pavement is considered too dangerous for pedestrians. I'm not entirely sure how much safer it is being just three feet away though. You now have to simply take your chances with the traffic. It's an adventure of sorts I suppose. I continued to walk east. Normally I go the other way but it occurred to me that there are still, even after all this time, areas of Helensburgh that I have only ever seen as we whizz by in the car. For instance, I had been muttering before about how there was no stretch of beach where I could be alone. Not true it turns out. Now, it's not a particularly pleasant bit of beach. There are no trees. Very little sand. It was immensely seaweedy and stony and there was a lot of litter. But there was nobody else there at all, and the wind drowned out the sound of the traffic and I could hear the gulls. It's an odd sort of bliss to be ankle deep in briny trash, but for a few minutes I couldn't see another soul. It started to rain so I left the water and headed back up to the street. I was going to write 'busy street' but other than cars pounding along there were very few people. I wondered how well-frequented the shops at this end of town were - a fishing tackle shop, a butcher and a cafe among others. They have been here years so I assume they must have clientele. I had it in mind to find the jobcentre. It used to be on the seafront (I think, think...it was where The Wedding Planner is now, but I might have that all wrong) but it occurred to me that I wasn't sure where to find it. It's not that I want to 'sign on', but I do want a job and it seems a logical place to look for one, no? It wasn't immediately obvious. According to Google it's on Charlotte Street. I walked up there twice and didn't see it. I will go again today and double check but it seems to me that you'd notice a thing like that. (It occurs to me that one day, in the future, there might be people reading ancient texts and they will keep finding the phrase "According to Google." Will they imagine that Google is some kind of god? Oracle? I suppose it is, really.) Can a jobcentre disappear that quickly? Evidence from the seafront suggests it might. I knew Morrisons was closing but the transistion from 'closing' to 'closed' still came as a surprise to me. The unit that used to be Acorn Art has been advertised as To Let for a while. At one point I wondered if I could afford it for a studio - how convenient would that have been? I couldn't. But a tattoo parlour could and judging by the activity going on in there yesterday, I could be in getting my 50th birthday tattoo by Friday! Things change, and quickly too, at least to outsiders that's how it seems. It's all relative. I wanted to carry on walking, seeing as I was not in pain, but in the end it was the weather that drove me back. 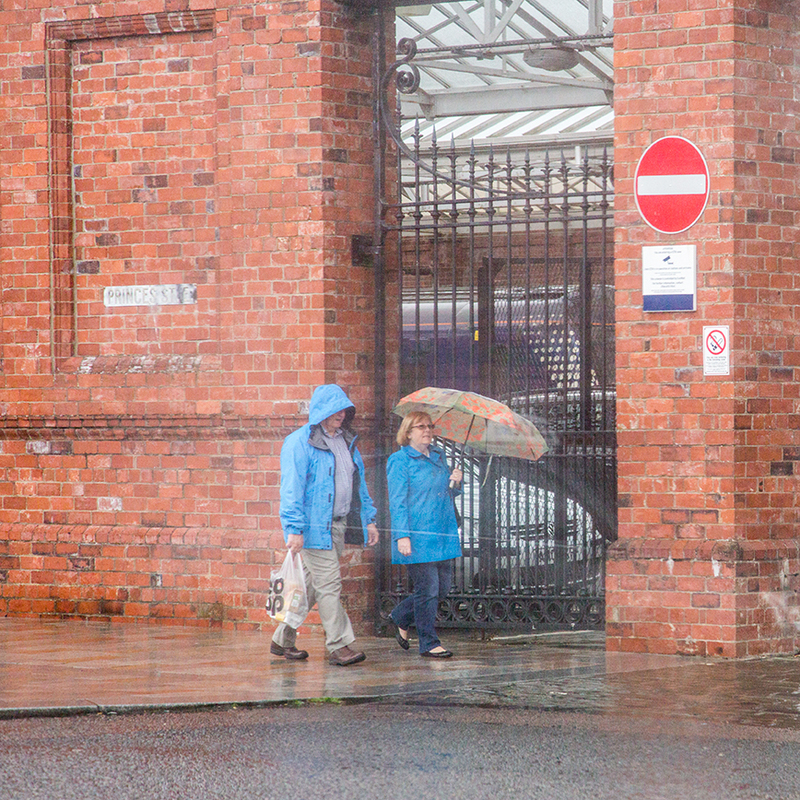 Someone apparently once said 'There's no such thing as bad weather, only poor clothing choices'. I evidently chose very badly and not having a coat, nor a means of keeping my camera dry, I took refuge in a bus shelter. It has been a long time since buses were a regular feature of my life. Enclosed, shrouded if you like in the metal and plastic casing of the shelter I felt protected. But a glance over to my left revealed a second shelter and I was aware the inhabitants of that one, like me, were pretty much in a display case; scratched and scored with the markings of previous occupants, it felt a bit like hiding behind net curtains, but revealed a whole lot more. I remember thinking the same about friends making use of the 'smoking shelter' in a German airport; they looked like zoo exhibits. It never ceases to intrique me how something flimsy, like a sheet of perspex, or the nylon of tent fabric can so markedly construct a boundary and define a territory. We don't need much to define us, to define our spaces. I stood in from the rain for about half an hour, getting colder and colder. Had I been properly dressed I may have been prepared to wait to get the shot I wanted but for the time that I was there, the general public were not cooperating. There was a marvellous orange brick wall in front of me, and I couldn't believe my luck when a couple in matching blue anoraks and an umbrella featuring orange-red poppies started my way. Alas, they jumped into a taxi before they reached the right bit of wall. Annoying, but a common feature of life for the street photographer. A crop nearly saves the shot but I will always look at it and remember the sharp stab of disappointment over the photograph that never was. Similarly, I took a photograph of the woman in the bus shelter on her own. A few minutes later she was joined by some unphotogenic folk in black coats who were probably perfectly lovely, attractive people but they distracted from my lady in the rain hood. At the same time a chap ran towards me with his takeaway in one hand, attempting to prevent his lunch from getting any soggier. If only, if only he had nipped past a few seconds sooner. If I were a painter, I'd have taken the two elements and put them together. But that sort of thing is frowned upon in photography which is still, even now, charged with representing the real, even when in fact it does no such thing. I cobbled them together anyway. Although it can no longer qualify as documentary, it better represents my experience of the bus shelter. And it occurs to me - we accept a film, a series of moving image, as a whole, as a truth. They blend and blur and create an impression over time. I feel then that there might be an argument for presenting several moments in one still image like this if it better tells the story of a period of time, albeit compressed. With that in mind I decided that I was also prepared to concentrate two other images together. Disappointed that my blue anoraks hadn't made it to the wall, I tracked another couple to see if they would walk beyond the taxi and appear in front of my preselected backdrop. They did, but not before someone else hove into the frame, blurry because I was focused much farther away. Individually, none of the shots did anything for me. But combined, they summed up the view I had and the experience I'd endured, both in terms of waiting out the weather and in the frustration of not getting the shots I wanted. I don't often perform these kinds of edit but it could be something to play around with - not so much because I like or need that sort of manipulation but because I'm interested in the idea of portrayal and versions of truth and reality. These two pictures are a fiction. They didn't happen like this. But they are a version of what happened. They remind me of those pictures you soemtimes see where someone has taken an old photograph and partially superimposed the modern view on top so that you can see then, and now in the same image. Only these images span a time frame of mere seconds, not decades. Cabin Fever. My natural inclination to 'nest' can sometimes mean days go by without my ever leaving this flat. It's not good for me. Any resolutions I might have made with regard to a daily walk are easy to sweep aside when it's raining, or my leg hurts, or there's simply too much to do. There's never simply too much to do. Eventually the call of a breeze on my face can't be ignored any longer and I have to venture out, find a reason; something more than "I want to be outside" which never quite seems reason enough. I found myself needing to be near trees. I miss my old haunts in the village where I could be alone on a beach or in under branches within minutes of leaving my house. Here, I have the water and I'm grateful for it, but no solitude. There are always cars, lorries, people. There is always the whumwhumwhum of a restaurant's extractor fan, the thwumpthwumpthwump of the shows on the pier, laughter, shouting, doors slamming, engines revving and only almost overpowering the base beat of some indeterminate techno. It's only when the wind is up so much that it's the only thing left to hear that any of it is drowned out. I miss sitting on a slightly damp patch of sand, nobody to see me, listening to the gentle slap of the Clyde where it meets the shore, the rustle of the air as it moves the leaves in the trees behind me, the call of the birds. I don't hear birds any more. On a positive note, when I started out on my saunter around the shops, my knee gave no trouble. I had heard at the Summer Festival that parts of the park were open again and so I headed there, hopeful that I would find some respite. I'd not been there two minutes before I met Jean Catherine. I don't know her surname and I don't actually know if she spells her middle name that way either but it seems unlikely that it would be the same as mine somehow. I must ask her if I see her again. I would guess that she was in her late 70s. She told me that she had spent the last fifty years living in America and we discussed our impression of the state of that nation. She told me she is 'a progressive' rather than merely a 'liberal'. We agreed that it is a broken country, but I can't in all honesty say it is alone in that. I like meeting strangers and talking to them. Usually it's a one-off, but as we parted, Jean suggested that we might meet again, if we were both frequent users of the park. I think I would quite like that. Alone again, I returned to my usual habit of photographing my surroundings. 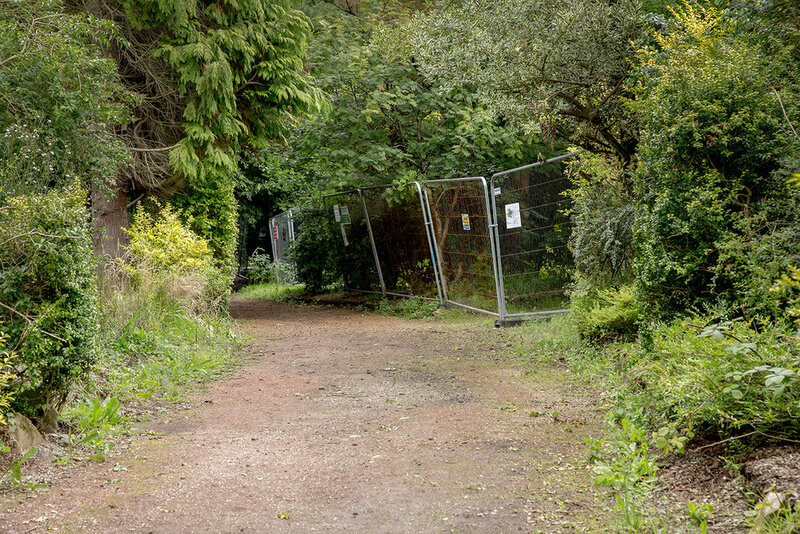 The park is in turmoil as the renovations are carried out, and only a small portion is available to walk. There's something about its state of unreadiness that appeals though and so what probably should have taken merely minutes ate up a good hour and a half of the afternoon. I enjoyed myself. I will enjoy repeating the exercise and look forward to seeing the park in a more finished state, although, I have to wonder if I will find as much to interest me. Knees Are Good, Knees Are Good...Who am I kidding? Early morning, February 2017, shortly before we were due to hold our WIP (Work In Progress) Show at The Lighthouse in Glasgow, I turned off my alarm and swung my legs over the side of the bed. There's not a lot of space down there, the room itself not being that much bigger than the bed, but enough to put my feet down and stand up. Which I tried to do. At some point on the journey between being seated and finding myself standing, my knee gave way. There was no twisting or turning, no jolting or slipping, no wrenching, just a sudden lack of support for the rest of my not inconsiderable self and a searing pain from knee to hip and ankle and back again. I sat back down and slightly sobbed if I'm honest. It bloody hurt! Without poring over every detail of the last six months, suffice to say it's still sore. There are days when it's better than others but the healing process is taking much longer than I expected and I'm fed up. I have noticed though, that on days where I push myself to walk further than I really want, the knee feels better for it the next day, so I have resolved that I'm going to try and walk myself to fitness. And, because I'm a photographer, and a documentary photographer at that, I figured I'd document my progress. Day one was actually the 3rd August. I walked from our home to the China Shop where I'm currently working on a project with the co-operation of the owner, and then along the seafront. I made it as far as the Commodore Hotel, a place where I have history, having once lived and worked there as the Bar Manager. When I worked there, the Hotel Manager took a notion to create a beer garden outside. Not wanting to invest vast amounts of money on expensive beer garden furniture, he acquired a job lot of white plastic patio furniture and made me drag it all, in and out of a shed at the back of the hotel twice a day, for security. Job lots of plastic furniture are sufficiently lightweight as to be eminently nickable but heavy enough in quantity to make lugging them around the hotel carpark twice a day an arduous activity of the sort I could really have done without. Thankfully, for the present incumbent, the new owners have invested in some sufficiently robust wooden furniture that would put off all but the most keen of thieves. I did note however that they have elected to use plastic plants in pots (my Ikea radar was buzzing) as table numbering devices. At first glance these appear highly stealable but closer inspection suggests that they have been attached to the tables with cable ties, possibly rendering theft more effort than the rewards would suggest it's worth. Walk number two, 4th August 2017, was a bit of a bust. The plan had been to nip round in a loop to Tesco, collect some bread and fruit to offer the starving hordes and then set off on a proper walk. The knee (which is rapidly taking on an anthropomorphic quality all of its own in my mind) decided not to play ball and I had to stop and take a documentary photograph of my position before I'd even left my own street. This was disappointing. I pushed on to the shops in any case (I was more willing to walk in pain that return to the cave without supplies) but elected not to go any further once everyone had been fed and watered. It did occur to me as I looked around for something to photograph that this could end up being the most random set of images ever grouped together. The only thing that links them is that they consist of things that caught my eye in that particular place. The plastic plants made me stop and pause, partly because I have a deeply felt revulsion for plastic plants, and partly because they just seemed so out of place...outside! I tend to associate plastic plants with Edinburgh landladies, turquoise flock wallpaper and ornate wire tea trolleys decorated with replicas of dutch still life paintings in amongst a pervasive aroma of Vim. Of course, the grass doesn't really belong in the wall either but I don't know if it will be possible to make a series of 'things that are out of place' at the same time as insisting that I document exactly where I was when the knee pain became noticeable. You can't ram too many concepts together. Perhaps there will just be a sense of cohesion brought to the project by the way that I see, or by the nature of the things that catch my eye. I guess we'll see. 4th Year at art school was hard. I mean, I know, lots of people have it worse, but mentally I was exhausted by the time I graduated and even then it wasn't exactly over as we had to finish up the degree show and get it down to London. It felt like a conveyor belt of endings and goodbyes and lasts. And then all of a sudden it was over. That was it. Nothing else. No more. No deadlines, no task lists, no library lists, no research, no meetings, no reporting back, no tutorials, nothing. I decided that I was taking July off. I needed a break, and I needed some space where I didn't have to think or push myself or worry about things. It was strange. My body clock was still thinking that 4.30am was a reasonable time to wake up but I had nothing to do so I ended up going back to bed. At first I tossed and turned and couldn't sleep but eventually I started waking later and staying up later. It was a slower process than I'd imagined, this deflating, destressing, and not entirely pleasant. I felt cut loose and free but adrift and purposeless. I was pleased when a fellow recent graduate suggested that we meet up and I think our decision to hold weekly 'tutorials' is a good one. Until such time as I'm fully employed, I have something to focus on and a reason to really start thinking about what I'm doing with my time. Last week, I think we both decided that we needed to be making work. I have a project that I began in a very small way at the beginning of the summer and this week I took steps to develop that further. As always, it has started out as a kind of mapping exercise as I explore this town that I now call home. The first set of images that I made were done with Ed Ruscha vaguely in mind - a shot of each of the businesses on the seafront in Helensburgh. I had picked a lovely sunny day when the town was full of happy visitors and I'm aware that I need to do it again on a wet grey Wednesday when it's deserted too. There was one shop in particular that held fascination for me. Uries, the China Shop, has been there since about the year dot. I first became aware of the owner when he was a regular customer at The Commodore Hotel and I worked there as the bar manager. He was like clockwork and always had a tale to tell. We called him Peter Urie and although someone did tell me that this wasn't actually his name, it stuck far more than his real name. It hadn't really occurred to me that his shop shared access with us in our new flat and that Peter would come to feature in my life again. But sure enough, not long after moving in, he made himself known to me again and offered advice and information about bin collection days. It has taken me nearly a year but I finally asked him if I could photograph him and his shop as part of my documentation of Helensburgh, and I'm delighted to say that he agreed. I didn't time my visit very well today and he was about to head off with his neighbour's dogs, but we agreed that I could start with the shop window. Tricky to get shots without me in them, and next time I go I will try a CP filter, but it felt good to be starting something - or even, which is probably more true, developing something. This time a year ago we collapsed onto our sofa, and tentatively looked around at what was to be our new home. It was a bit of a come down from what we'd been used to: from a detached five bedroom house on the edge of a semi-rural village to a two bed flat above a Chinese takeway in town. Did I ponder where I'd be in a year's time? Probably not. I was pretty tired from a day of working out where what was left of our stuff was going to go, and somewhat emotional about what we'd just left behind. Putting on a jolly face can be exhausting. I knew we had no choice, and I was trying very hard to paint a picture of adventure and new starts, but honestly I was just sad. And lost. Much has changed in the last twelve months, and much remains the same. As is always the case I suspect. We are still in the flat and because the last year has been so busy, nothing has changed here. I'm now starting to think about decorating projects and DIY that we could attend to. I have completed my last year at art school, and gained a degree. I have more confidence in my abilities as a designer, artist and photographer, but worry now about getting a job for me, as well as one for my husband. And of course I am no longer 'a student'. That part of my identity, that signifier for who I am and what I do has been stripped away even as the degree was conferred upon me. In many ways, I feel...reduced. My routine of waking at 5am to read/research/write until it was time to wake the children for school has gone. Their summer holiday means they don't need to get up and not having a tutor breathing down my neck, wafting deadlines in my general direction has resulted in me going to bed later, drinking more and sometimes not waking until 10am. I am adrift and my days sometimes feel as if they could be drawn, performed, with just a few repeated gestures - shorthand for the markers that take me from day to day. I need to make work. I need a focus and a reason to do more than exist. And frankly I need something to be angry about. I've spent so much time over the last year not being angry because I was afraid that if I gave vent to the fury it might consume me completely, and now I don't know if there's even a glimmer of anger in there any more. Have I supressed it to such an extent that it is buried and suffocated? I hope not. There is potentially more to be angry about now than ever before. How to find it? And more importantly, how to use it? Two things struck me recently. First is that because of a knee injury, I'm not as mobile as I'd like to be, and I rely too much on painkillers to get through the day. And second is that it's just about impossible to go anywhere or buy anything without plastic. Well that seems like two things to get angry about right there. For the first, it is my intention to try and get moving again and to document the process as a means of motivating me to get off my arse. For the second, well, I can't claim ownership of the idea but as a start I've adopted a jam jar as a water bottle/coffee cup. It will go into my bag, complete with lid, and should reduce the number of times that I feel the need to buy a plastic bottle of water or buy a single use cup of coffee. It's just tiny, and it's not enough but you have to start somewhere.